Explore the Schenley Farms National-Register Historic District in Oakland with docents from PHLF. Hear how real estate developer Franklin Nicola (1860-1938) realized his dream of creating an example of the “City Beautiful” ideal. Where cows grazed peacefully on a steep Oakland hillside, Nicola saw grand boulevards and elegant homes, hotels, and clubs. We’ll walk along the quiet residential streets of Schenley Farms, where Nicola’s company developed a high-quality residential community with the latest modern conveniences. And we’ll see what happened when Nicola encouraged some of the most notable regional and national architects of the early twentieth century to design some of Pittsburgh’s grandest buildings. Participants will take a brief look inside Soldiers & Sailors Memorial Hall & Museum and William Pitt Union (originally, the Hotel Schenley). This tour will reveal the power of historic preservation, since many historic buildings have been sensitively repurposed for new uses. 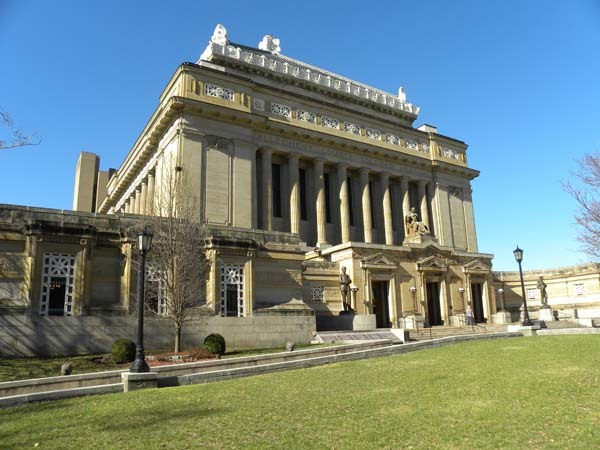 Special Performance: At the beginning of the tour, participants will be invited into the auditorium of Soldiers and Sailors to hear a 15-minute performance by young musicians from CMU’s Creative Expressions summer program, under the direction of Jennifer Dorris. The students will be performing original compositions inspired by the life and work of Henry Hornbostel (1867-1961), who designed Soldiers and Sailors Memorial and other notable landmarks in Oakland. Paid reservations by Tuesday, June 12, 2018. Parking: Public parking is available at the Soldiers & Sailors Parking Garage. Limited on-street parking is available in the area.